ART BARTER is a series of physical exhibitions in different cities where the public is invited to bid on anonymous artworks by artists living and working in the host country at that time. The only offer that is not valid at an Art Barter event is money! Visitors have to get creative and try to win the artworks by offering their skills, possessions, services, hobbies or anything else that they can dream up, encouraging them to think about what they have that is unique and how much they personally value the work. other influences. This also allows the artist’s to value their own work via non-monetary mechanisms as they ultimately decide which barter to accept. with enthusiasm by artists and the community alike, offering a refreshing point of entry into the realms of collecting and exhibiting. 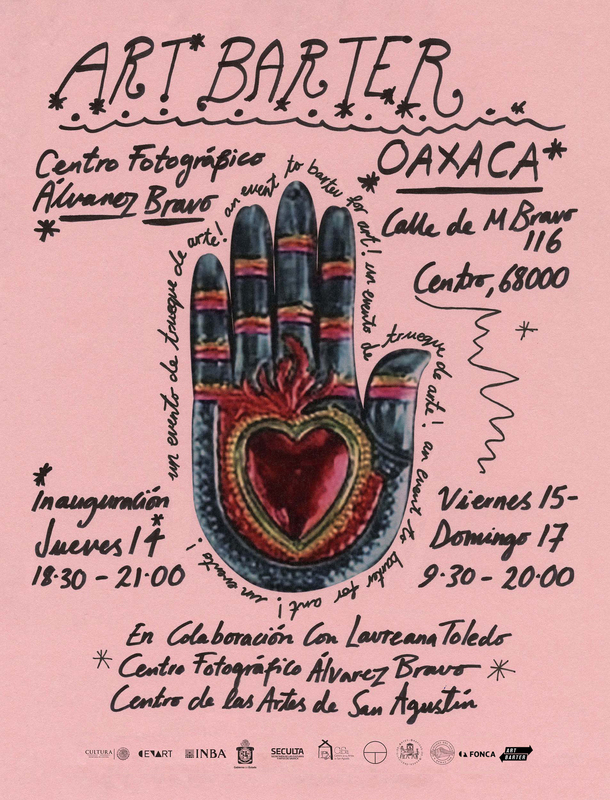 Art Barter now returns for its thirteenth edition in OAXACA in collaboration with Laureana Toledo at the Centro Fotográfico Manuel Álvarez Bravo from Thursday 14th - Sunday 17th December 2017. N.B. Please do not bring your items to barter with you, there will be forms within the exhibition where you can make your offers. Thank you.